Jim made his stage debut as a soloist in the mid 1970's at a Talent Show. Travel back with Jim as he sings The Greatest Hits Of The 20th Century including the Standards, the 50's, the Movies and Stage. Also available to sing "The National Anthem". Four acrobats jump, flip, climb, in out and around a freestanding cube. No rigging is required. 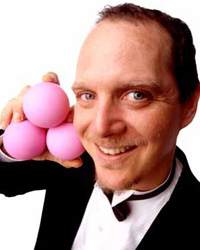 Frank Olivier delivers an outrageous interactive comedy show with worldclass juggling, headliner comedy, magic, unicycling and other death defying stunts.